Greetings friends and hobbyists! 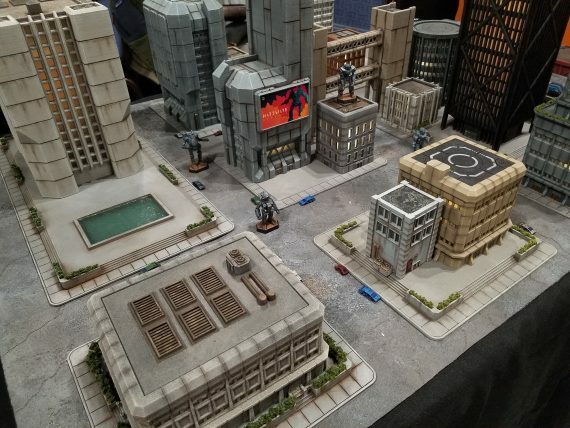 Adepticon 2019 has just recently passed, and what a treat it was! (mostly). 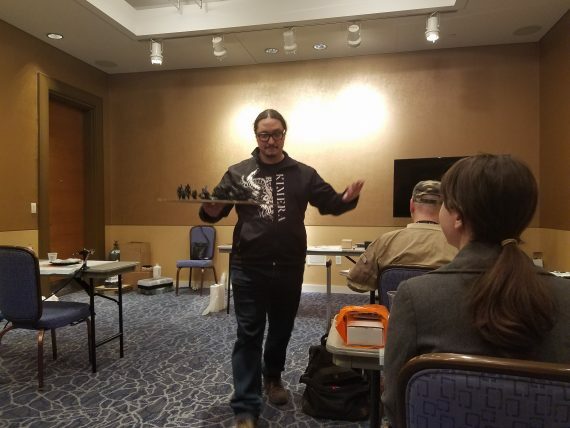 This has now been my THIRD Adepticon, which may seem like a small number, but I really feel I've delved deep in to this hobby over the past few years, improving the amount of painting, building, and gaming in my life as each year passes. 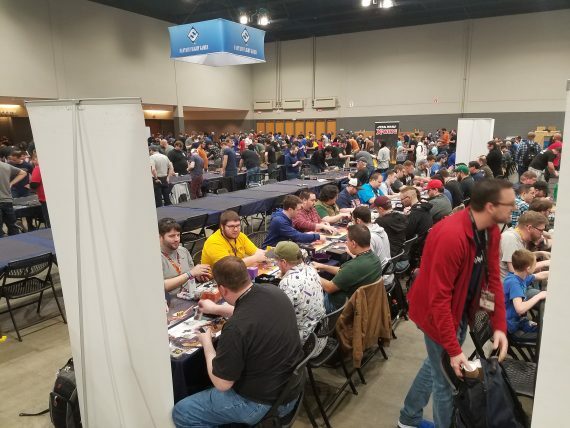 I'd just like to share some of the things that caught my eye and interest as I learn how best to take advantage of this amazingly vast convention! Hopefully, I convey myself well enough mostly through these images, but will add some extra commentary as I see fit. So, come, enter the halls of this great gathering of friends! Once more unto the breach! 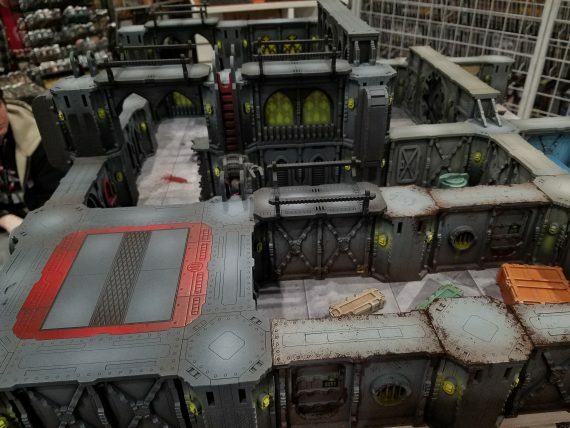 Entering the grand halls of Adepticon! 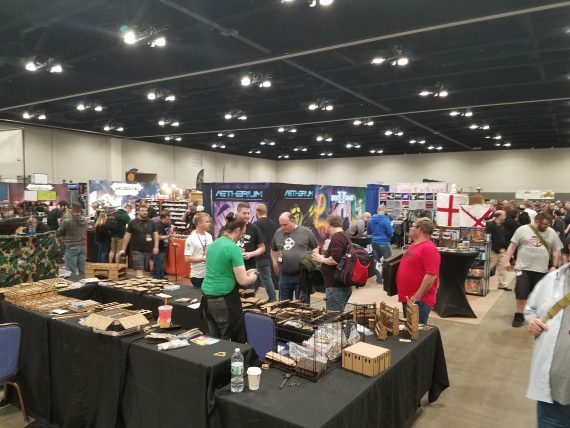 Immediately upon entering the main hall, your senses will be bombarded by an awesome variety of vendors, gaming enthusiasts, and fantastic tables! It's just huge, and even images can't convey the scale. 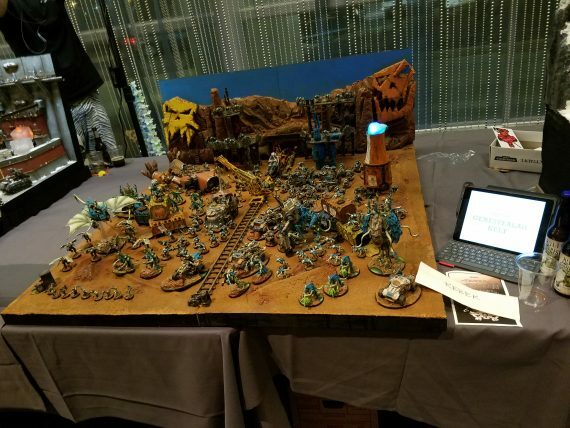 I started off this hobby as kind of a lonesome painter and rules-reader, not much in the way of having a large minis-gaming base to draw from. 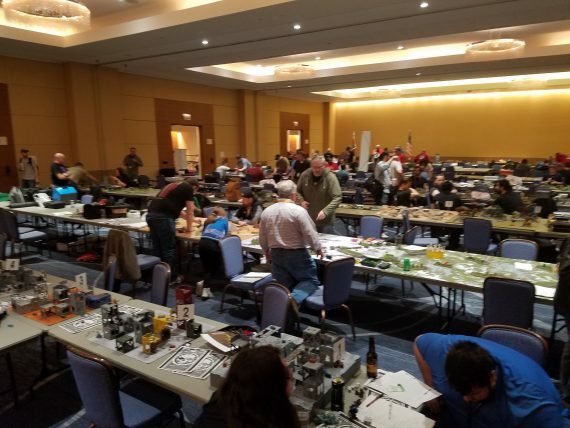 Events like Adepticon really change that feel. I felt immediately bonded to the people around me, who in a sense, are all craving a shared experience. This year, for participating, I got a swag bag! 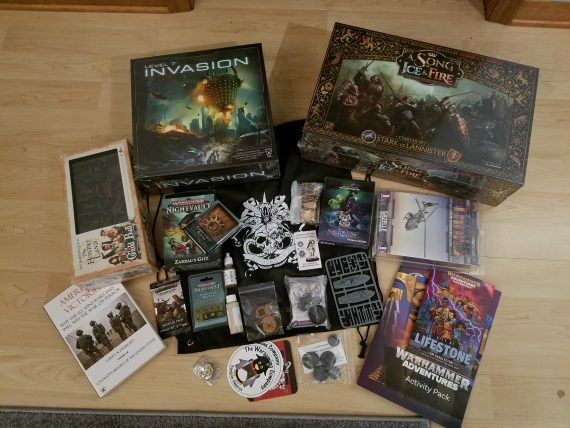 Crammed full of stuff...a full Game of Thrones minis starter, a neat looking board game that reminds me of the strategic overworld element of the original XCOM computer game, some more NightVault Gitz (I actually already have this set...but would love the opportunity to try some alternate paint schemes! Albino goblins? 😉 The Farmer's Guild Ball team is pretty neat also. 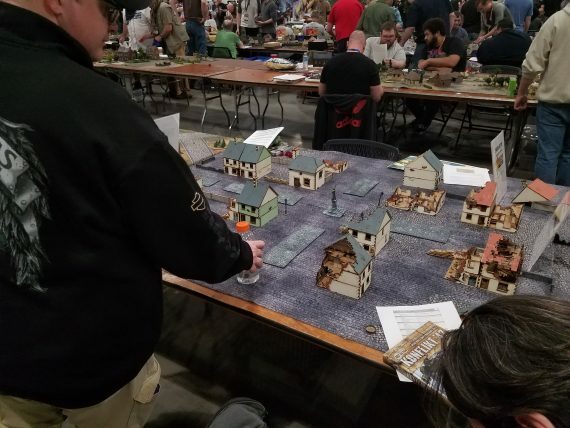 I really like the Guild Ball ruleset and own a bunch of other guilds for it. Somehow, I avoided buying the Farmers, so that worked out in my favor! 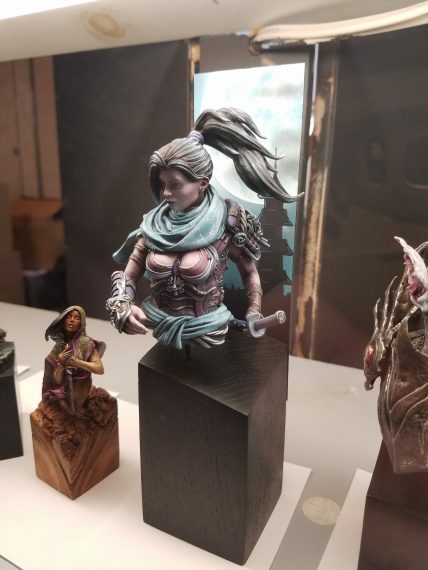 A few random models, bottles of paint, books, mdf pieces. I see what the buzz is about for these things! First stop for me, tends to be the vending hall! While I shop a lot online, there's something about having all of this cool stuff to look at in person that really captures my attention. 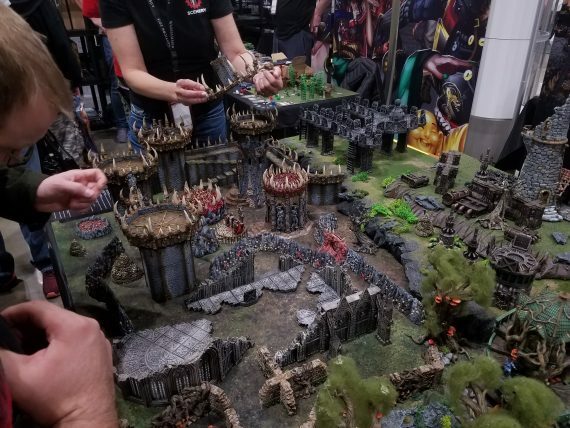 Whoa, some absolutely great 3d terrain! 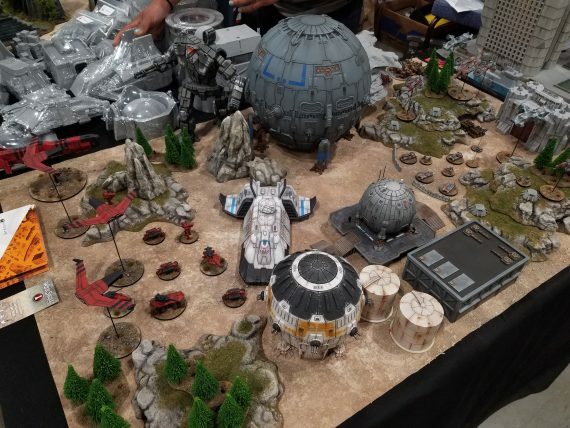 I feel like Star Wars Legion had a much bigger presence this year, being introduced last year, and the terrain on site was really fantastic! *DROOL*....this is a new MDF building from Warsenal. It, sadly, wasn't available at the show, but will be coming soon. 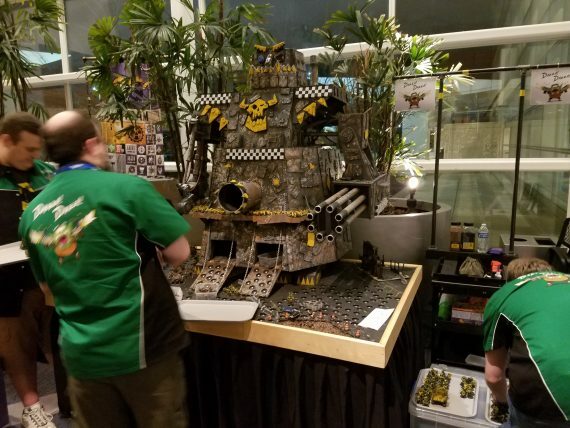 The complexity and paintjob on this was jaw-dropping. I'm a big fan of the company, and own a ridiculous amount of their things, and they continue to surprise me! From the rear, for painting reference. A Shovel Knight, minis-tabletop dungeon crawl game. The guy running the booth asked if I wanted to jump in a quick demo, but I didn't have time. The minis looked really cool for anthropomorphic animals. 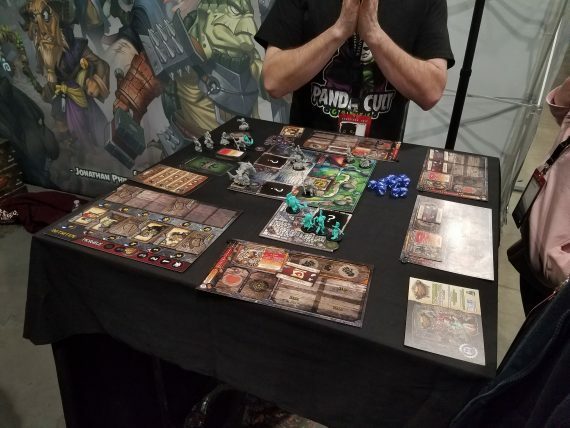 Is the gameplay similar to Arcadia Quest? I may have to research this title more. 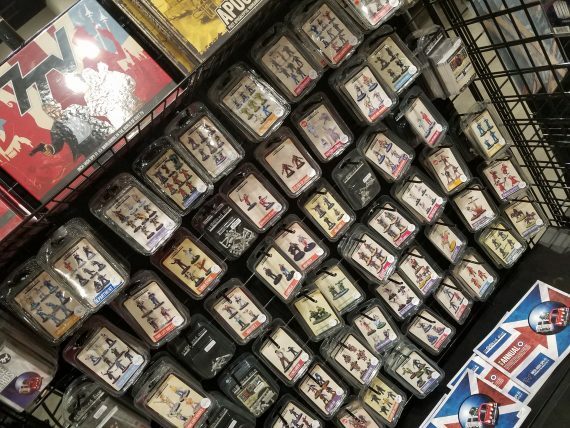 While Warhammer, Warmachine, and Bolt Action are basically everywhere, it's nice to see smaller vendors like Crucible Crush set up. 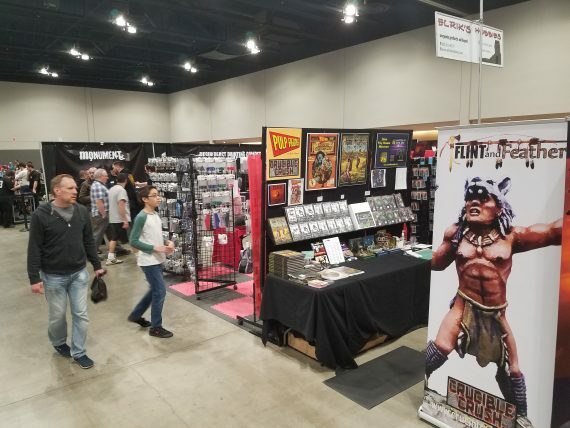 Flint & Feather had a lot of really cool Native American minis for it, and the booth itself had some really cool pulp-ey miniatures available for sale. 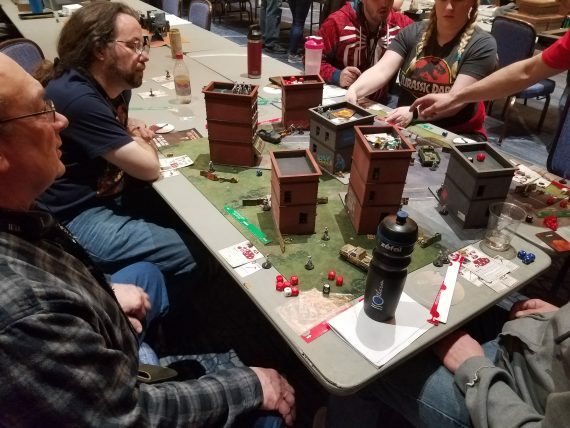 They were also showing off the Black Sun IP, a Cthulhu-Vietnam blend wargame, which seems like a great original setting! 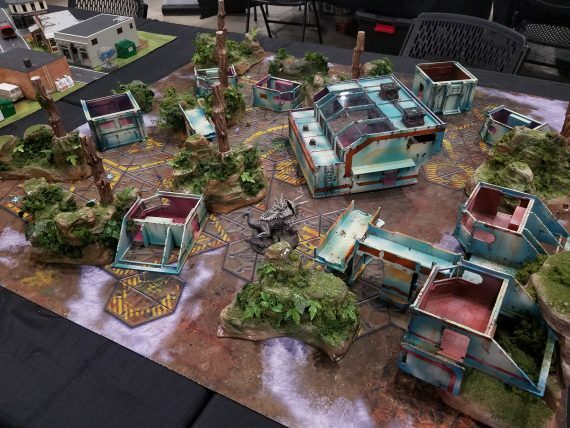 This Blood&Plunder demo table has been a staple every Adepticon I've attended. I really need to learn to play this game. 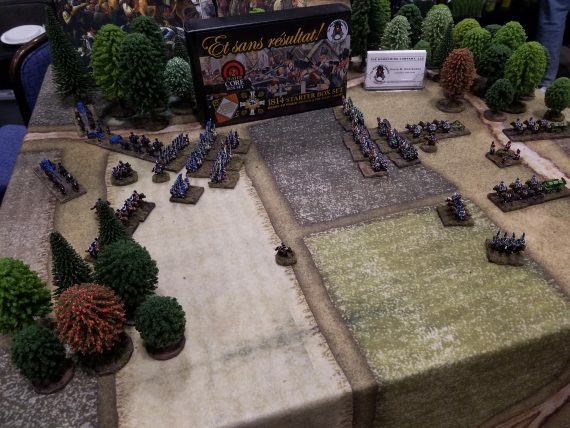 Their minis are sweet, and the creators are really nice gents, passionate about their game and history. 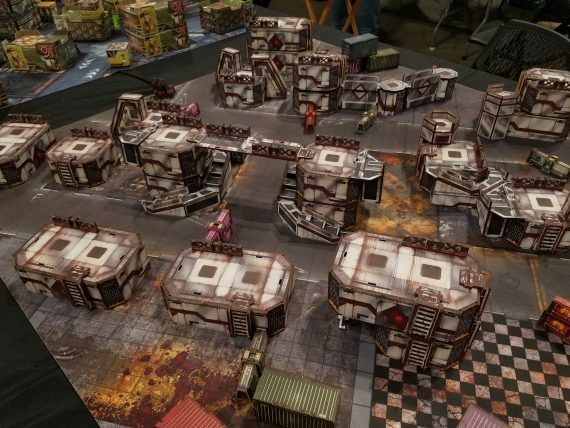 They just recently kickstarted a smaller scale ship-combat game, Oak & Iron, which looks great as well! I've really grown to love pulp gaming as of late. 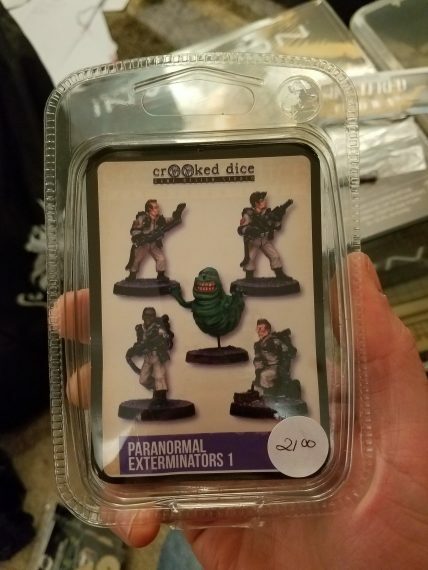 So, finding this Crooked Dice minis booth was right up my alley...my...Pulp Alley, so to speak. 😉 😉 7TV is their own game, but these minis can be used for a wide variety of systems. Some of them are based on popular IPs, and look super fun to paint! Whoa, MDF has come a long way in the past 5 years! I really dig that giant dish! Deathray Designs is one of my favorite booths. 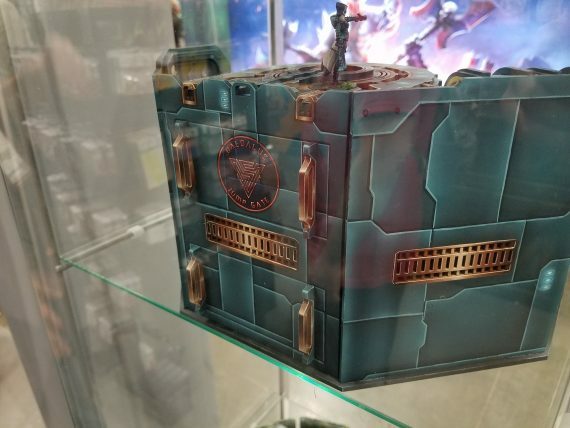 They make such cool stuff that is FUNCTIONAL as gaming pieces. 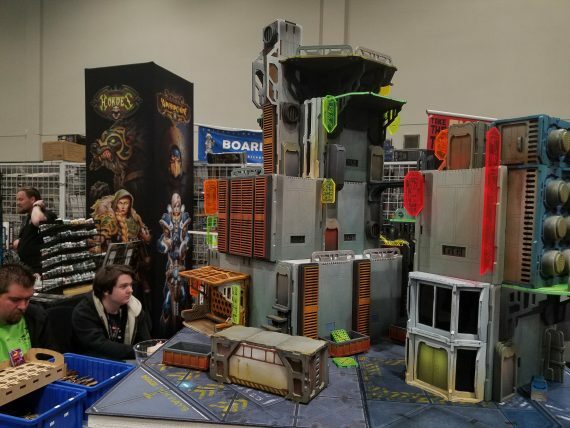 These are "dungeon"-type walls, but more industrialized so as to fit things like Necromunda. 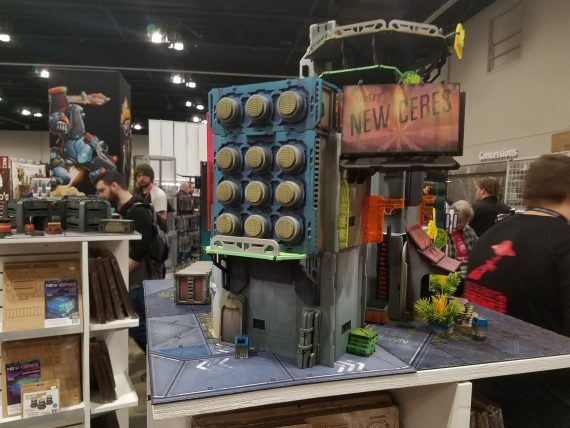 They're modular, fit together different ways, and intermix with some of their other terrain, like a Fallout vault door, and some gothic, 40k pieces. 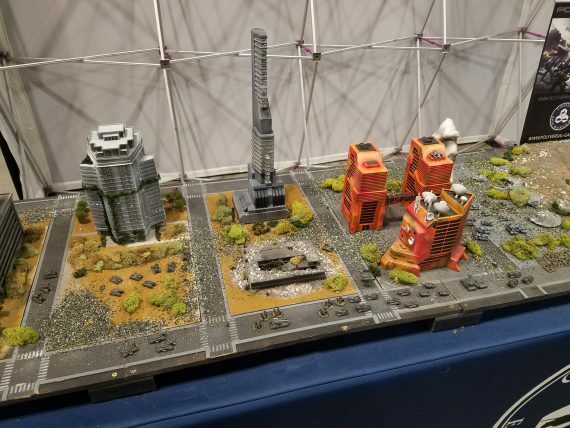 DeathRay Designs new line of cyberpunk future buildings. 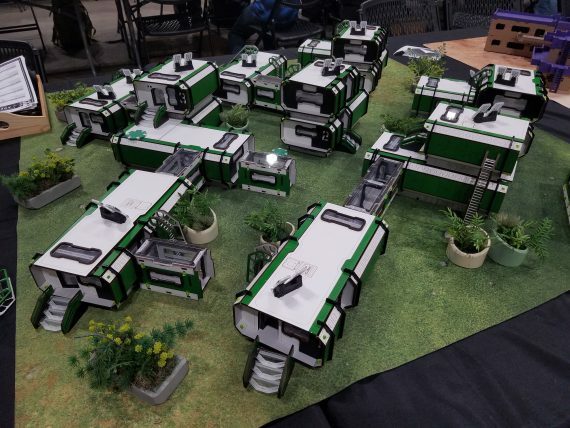 These are also modular in nature, as many of the base building structures have slots in them that you can hook on "facades" and signs in different places getting a variety of looks from only a few building sets. The facades remind me a big of how certain Warsenal lines work (but with magnets). Really cool stuff for the cyberpunk fan. Some more examples of the New Ceres line by DeathRay Designs. 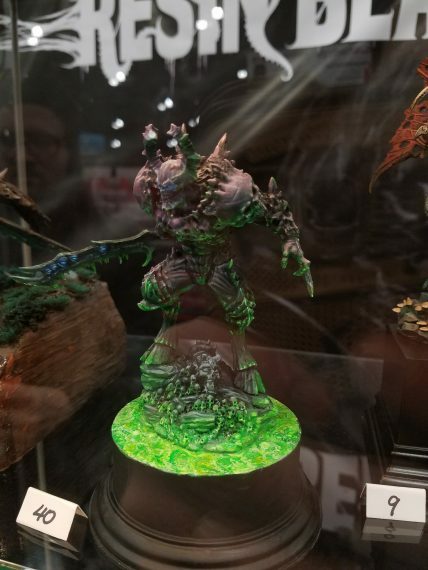 I totally missed out on the Creature Caster booth last year, as I wasn't really a 40k player, or a large scale model person. That's changed in the last year as now I'm almost solely searching for oddball models to build and paint! 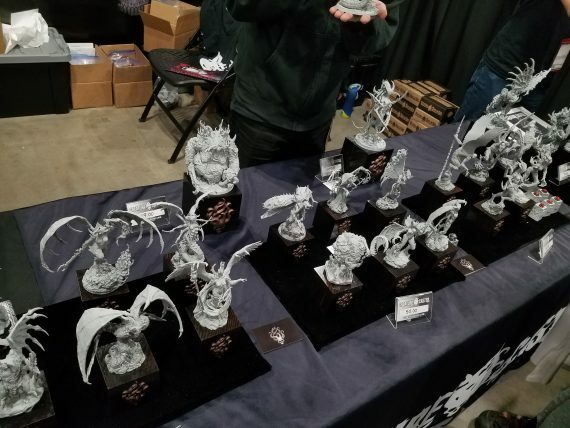 These things are awesome, large resin monsters, meant mostly as alt-sculpts for 40k demons and beasts, but as centerpieces for your painting shelf they'll do just fine. 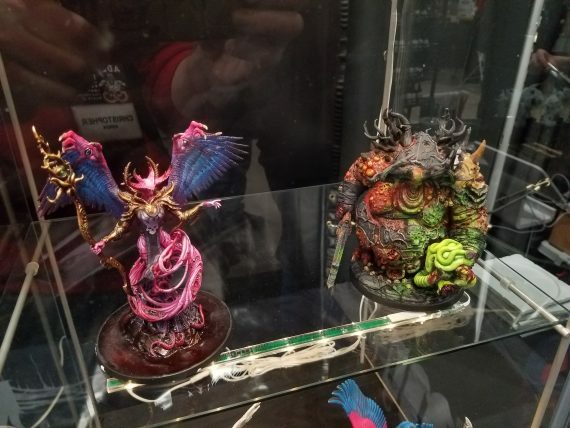 As somewhat of a surprise release this past year, Creature Caster released a line of paints (well...it seems like EVERYONE released a new line of paint this last year, but more on that later! ), Pro-Acryl. These paints have been getting some mentions from the youtubers I watch, so I wanted to try them out. 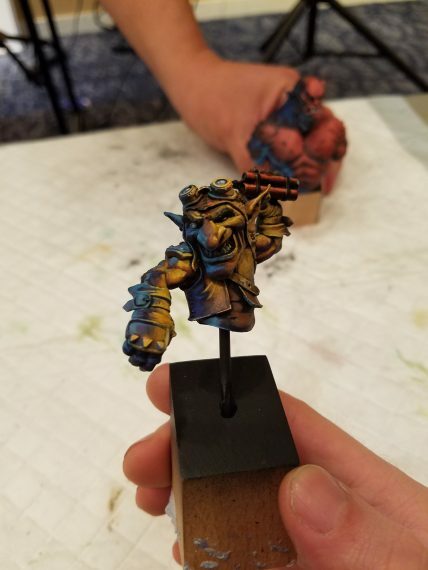 Luckily, their in-booth painter let me try them! They seemed pretty smooth with good coverage so I grabbed a few bottles to try out at home. (As of now, I use Vallejo, p3, scale75, reaper, artist acrylics, inks, minitaire....so it will be nice to compare.) 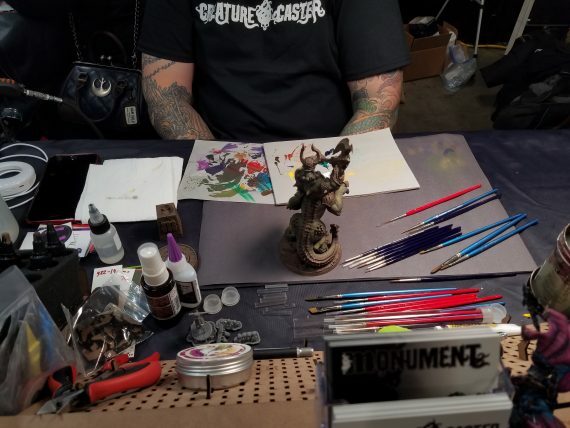 Later on, the amazing painter James Wappel was giving some demos as well. 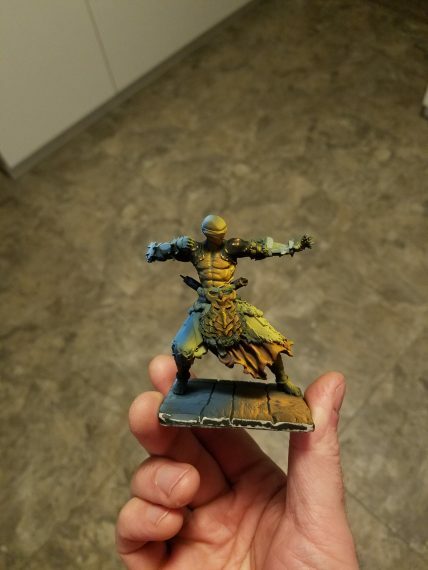 I don't know how he painted standing up like he did. 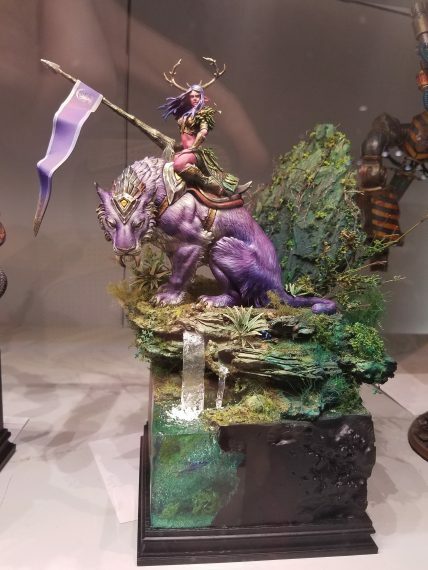 This was the newly released Creature Caster model. Once I saw it a few months ago, I added their booth to one of my first stops! Looking forward to painting that one! So rad! 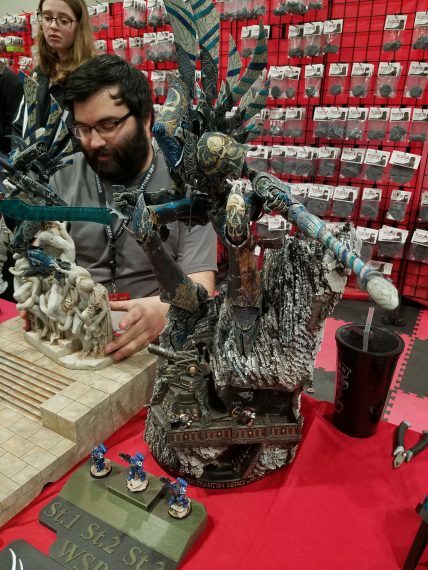 Scale75 booth was filled to the brim with awesome large scale models, paint sets, Banshee's new book, their tabletop games...so much to see. 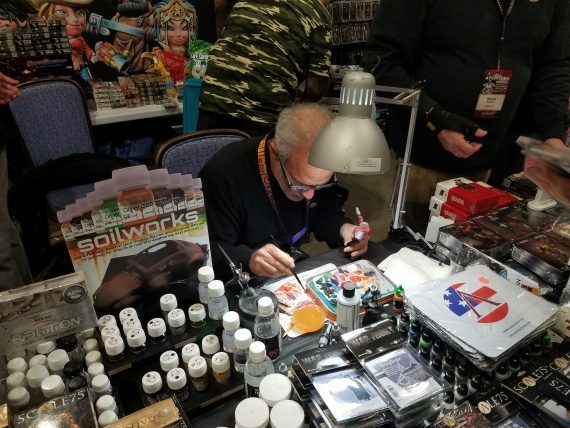 The famed miniature master painter Julio Cabos was on site painting! An awesome opportunity to see artists like this at work. 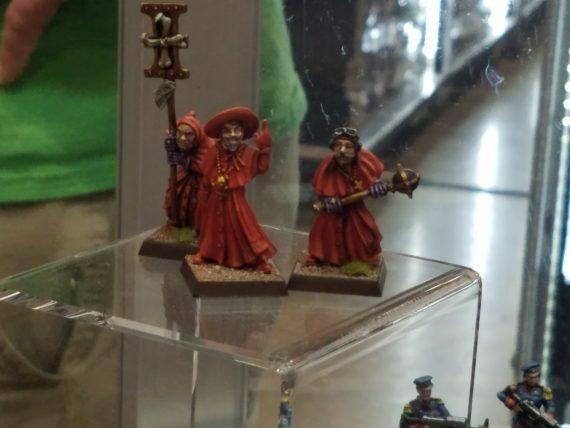 NOBODY SUSPECTS THE SPANISH INQUISITION! 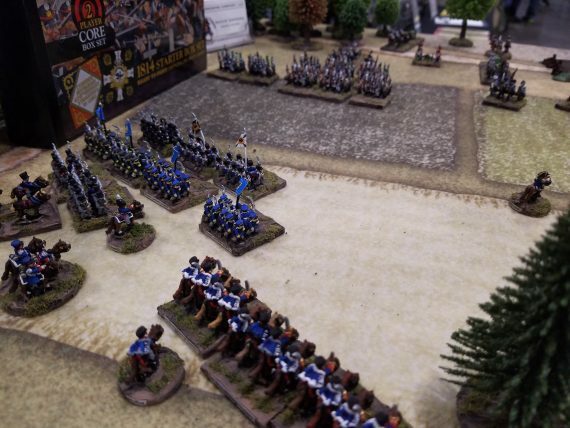 These were Victoria Miniatures models. 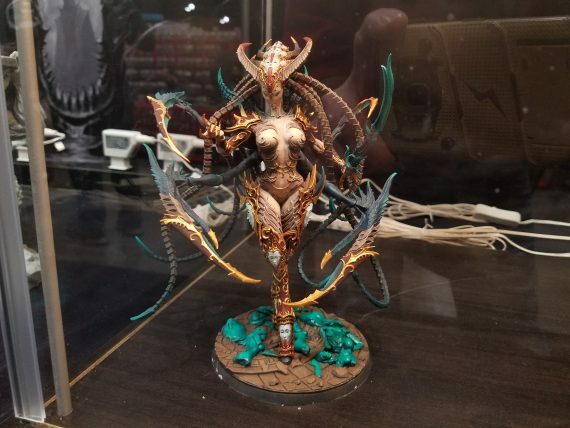 I must admit, besides being promoted through Reaper at one point, I don't know much about the company, but their models did catch my eye this year! 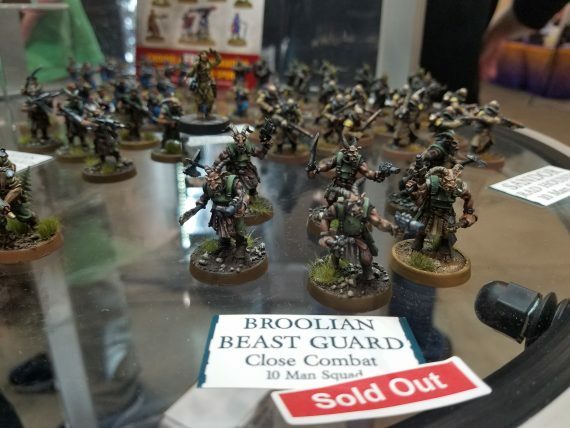 I really dug those beastmen soldiers as well. Perfect as a tainted Imperial Guard in the 40k universe. I'm a big fan of Arena Rex. 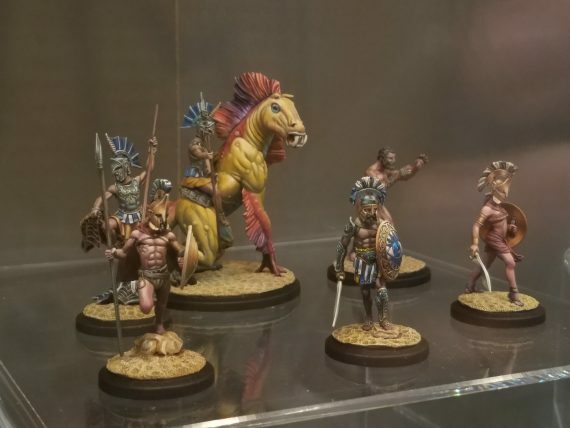 Here we have a painted sampling of the Helleniki (Greek) faction. 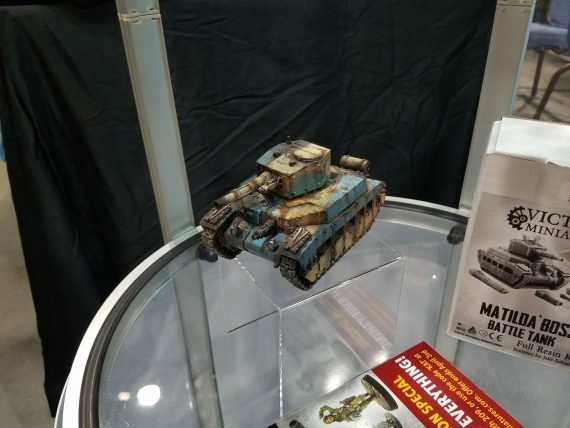 These guys were just barely announced at Adepticon last year, but weren't quite ready. 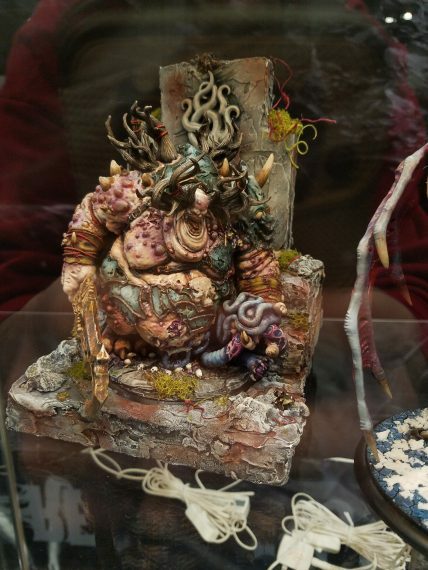 I love their studio painter and their sculpts. I did purchase the new Zephyri model. Such a fun IP and rule system. 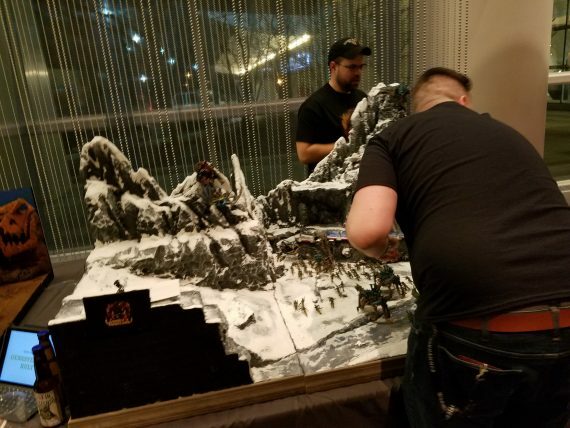 Last year these guys had an awesome snowy-wall-breach table set up. This year, they brought the heat. Amazing display! 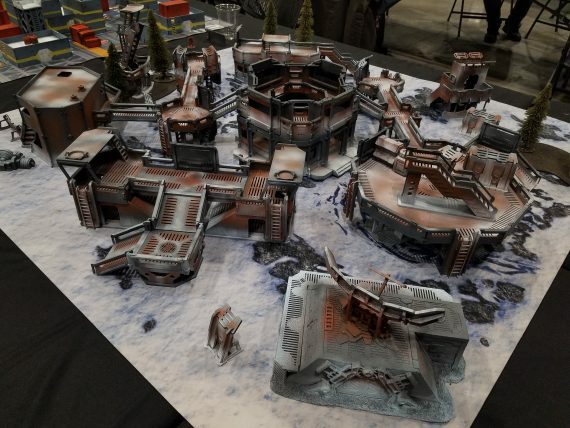 Sadly, don't know much about the game besides the slightly larger scale of the models, but they do look great. 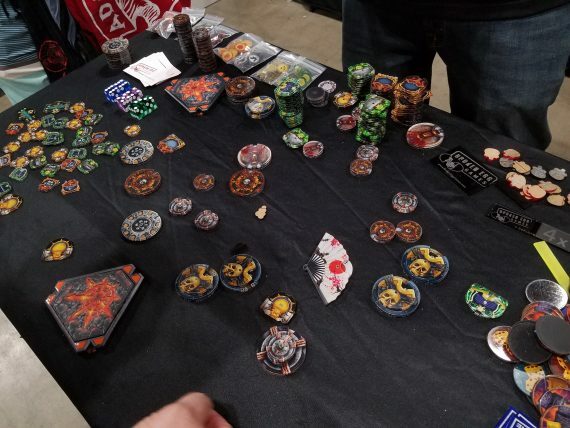 These were some lasercut dials and markers from Broken Egg Games. I didn't have time to really pour through these, but they looked pretty amazing and would make great counters for any general gaming. Really tempted by that fan. Laser cutting has come quite a long way in the past few years! 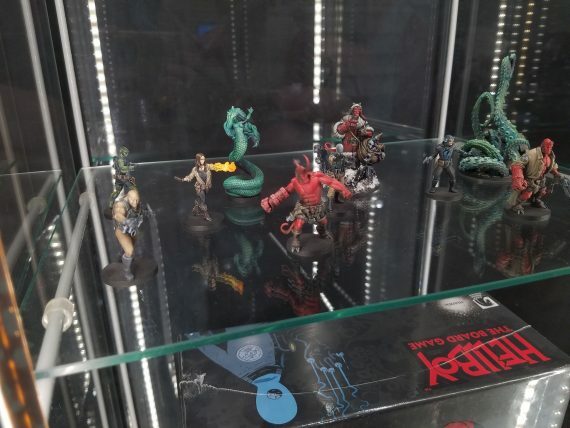 Shiny new Mantic Hellboy board game minis! Glad I backed that! 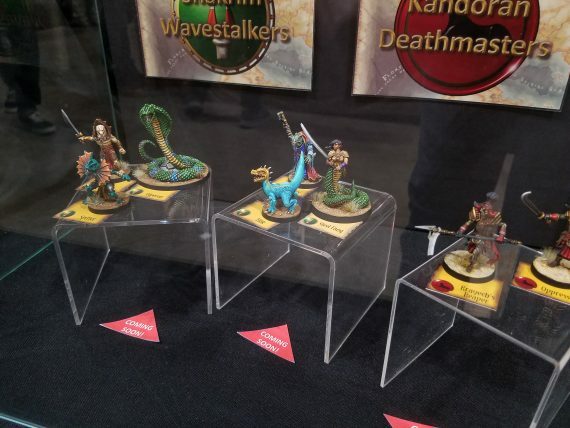 Wow, the new DGS Games Freeblades models on display! I tried their game last year and really enjoyed the system and the creators passion for their game. They're very active about building their community, and evolving the world they've created. 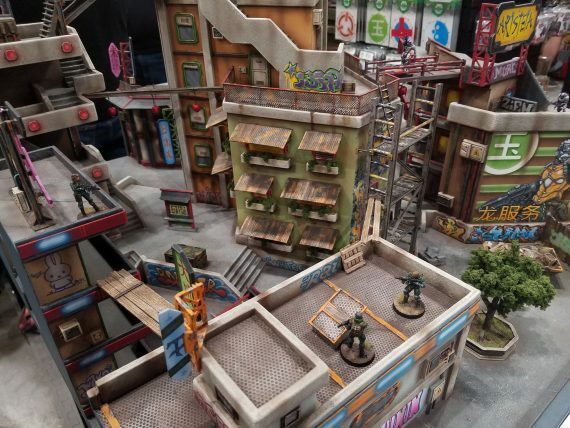 Plus, their models have a classic old school vibe that really clicks with me. 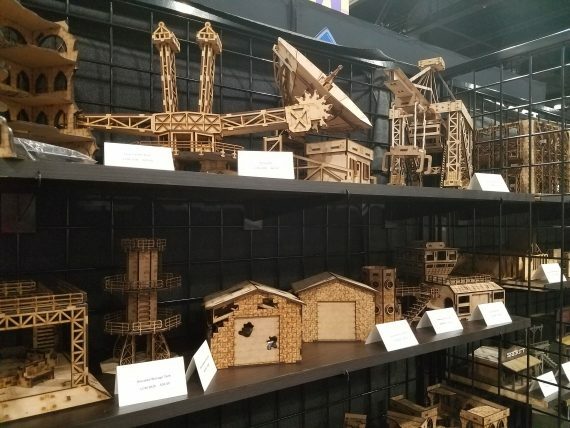 Whoa, I believe this stuff was all 3d printed. 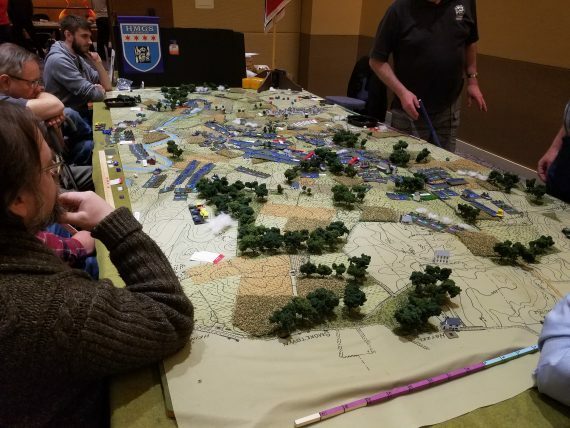 Large scale Battletech stuff. 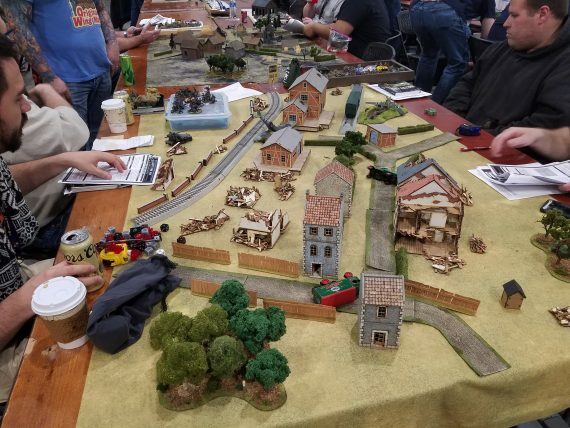 In terms of terrain, we truly live in a golden age of wargaming. 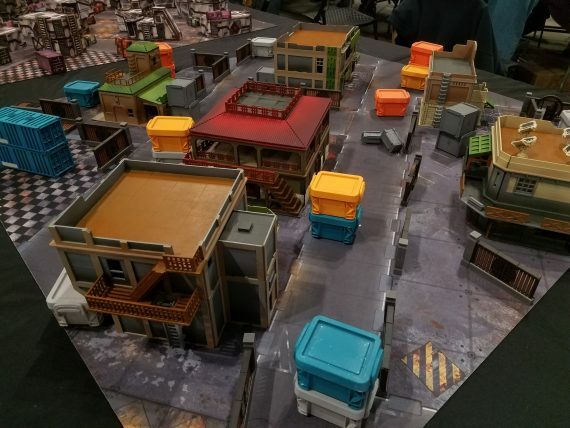 Some of that DeathRay Designs necromunda terrain in action. I actually own a starter set for this, which I'll have to get painted soon! I'm not sure how many sets this was, but it was so expansive. 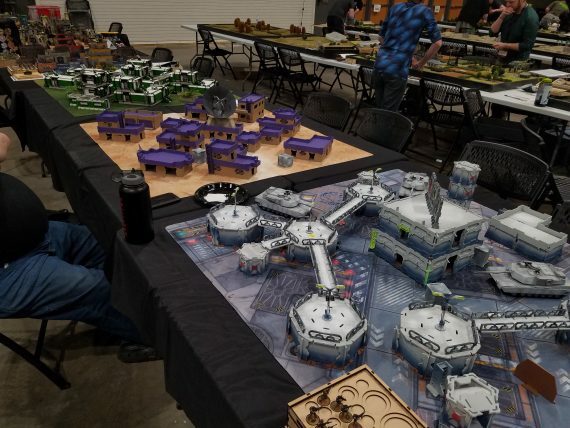 I'd love to play on that table. 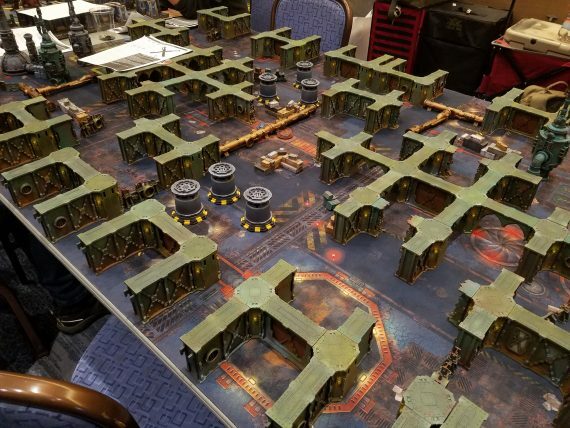 And now...a bunch of Infinity tables! 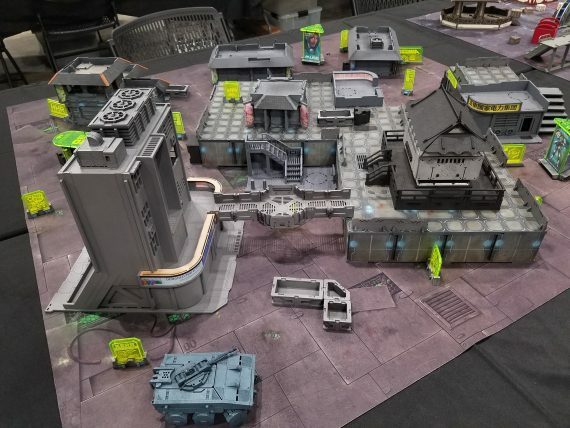 Infinity is such a terrain heavy game that I feel the tables have eye-catching setups by default. They always seem to draw my attention most. A more monochromatic take on Warsenal stuff. I own a few of these too that I've been in the process of giving a retro 80s cyberpunk vibe to. Simple paint scheme, but very effective and coherent! Great mix of organics and technological. 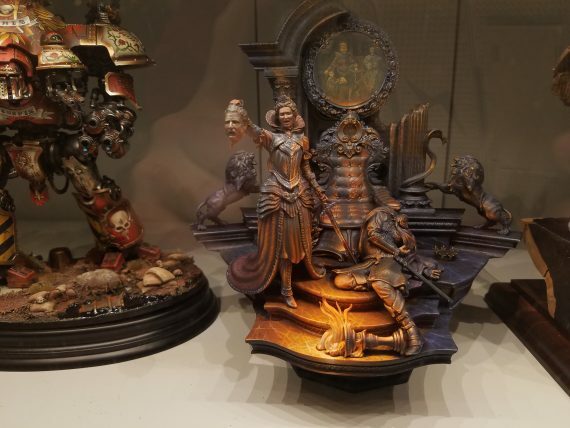 This is prepainted mdf stuff I believe. 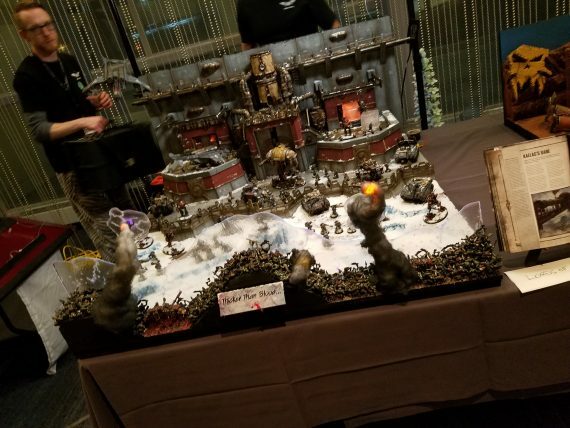 I feel like the vendor was at adepticon last year, but didn't notice them this year. Really nice looking though! 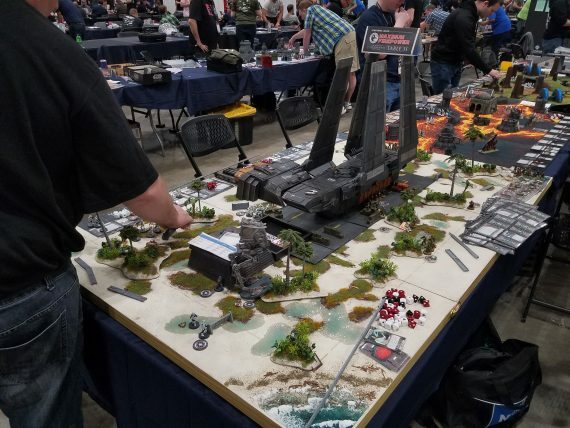 Warsenal always has a few great looking demo tables. So cool! 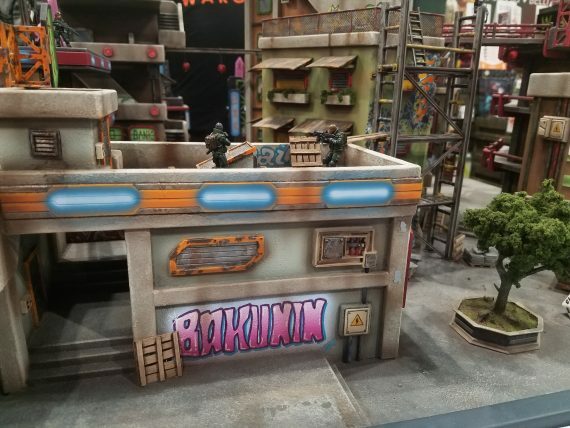 I need to start adding more graffiti to my terrain. 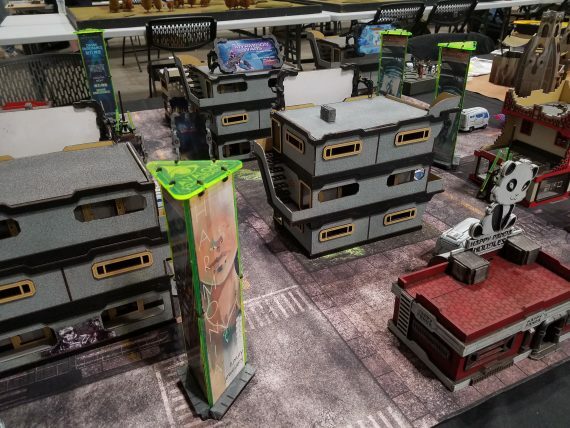 Printable Scenery. This stuff was ALL 3d printed! Seeing their booth last year made me back their last 2 kickstarters and buy a cheap DIY 3d printer. While my outcomes experimenting with 3d printing have been mixed so far, I know with more tweaking making stuff like this could be very common. So impressive in person. ZOMG! Tiniest scale I've ever seen....from this view, it's like a giant ant's view looking at regular ants from space. Wait, huh? *scratches head* ...wonder how they paint the eyes. 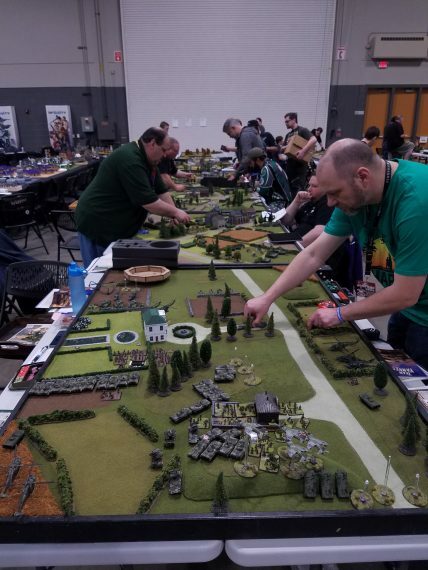 Kind of glad to see a good historical wargaming presence at the con too. As I get older, I'm finding myself more attracted to this kind of stuff. Not sure how they made that ship. 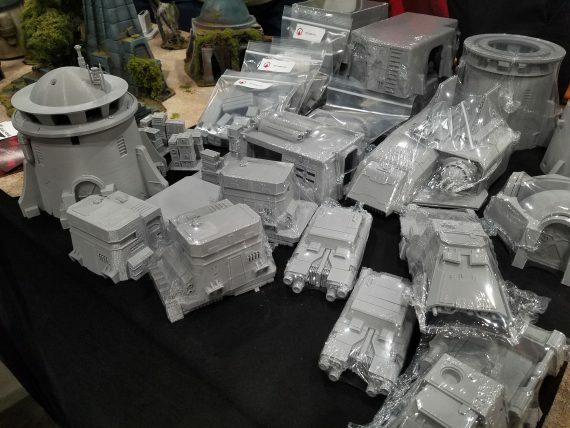 I'm sure there are some blown up stl files out there to print the components since Star Wars is such a popular IP, but I wouldn't mind having one of those for sci-fi gaming in general. 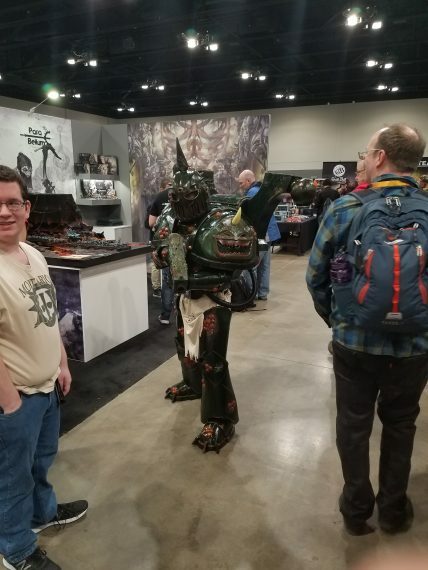 I was glad to see Konflikt 47 having a good presence at the con as well. 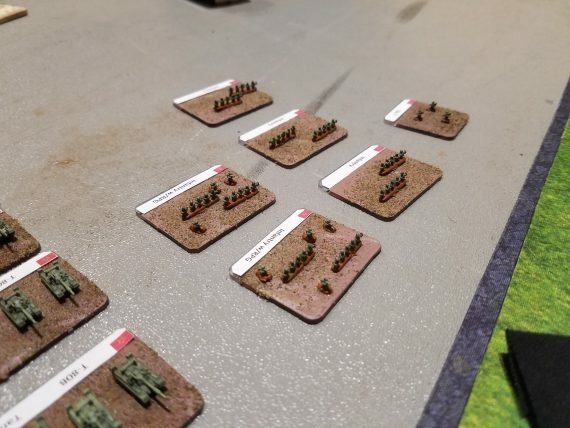 I enjoyed the humble beginning of my little army and would like the game to still be around by the time I finish! Our group says generally good things about it so far, so I hope the range keeps evolving. 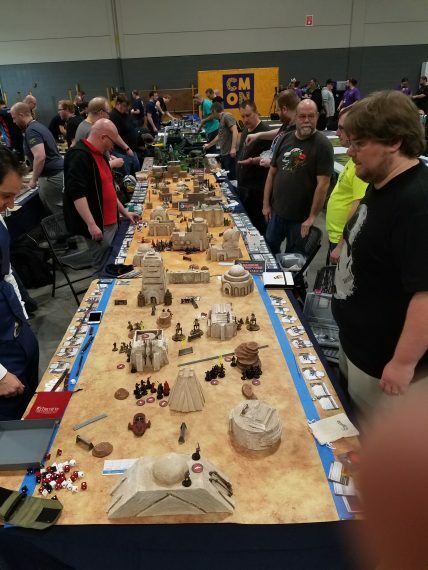 MASSIVE Kings of War battle. There was a similar game last year, and I enjoyed talking to the people running it. 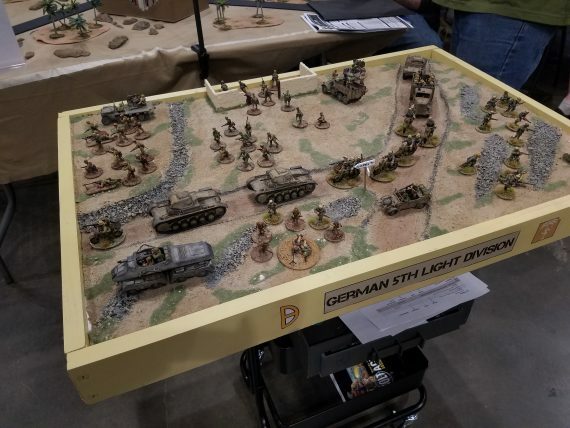 Seems like a great system for huge 28mm scale battles! 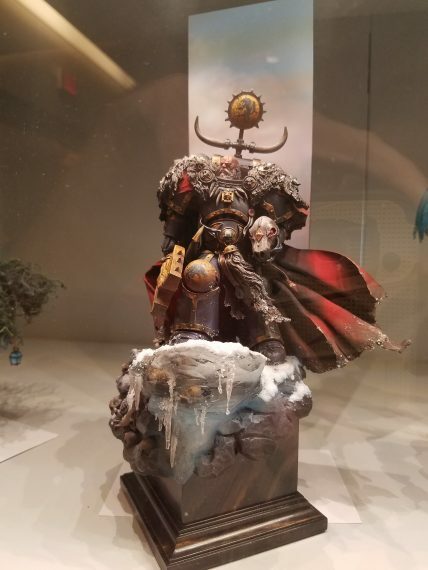 For most people who invite me in to their home, if I ever see their basement, it's usually filled with some boxes, bins of holiday decorations, an old pool table that serves as a storage table, an old tv....but if I saw this sitting there, or a shelf full of painted armies, I'd probably be like: "I think we're going to get along, juuuust fine!" Hey, look! Mantic's Walking Dead being run by....someone else! Get'em guys! Haha, this is a fun system though. I'm a fan, and glad to see others enjoying it. 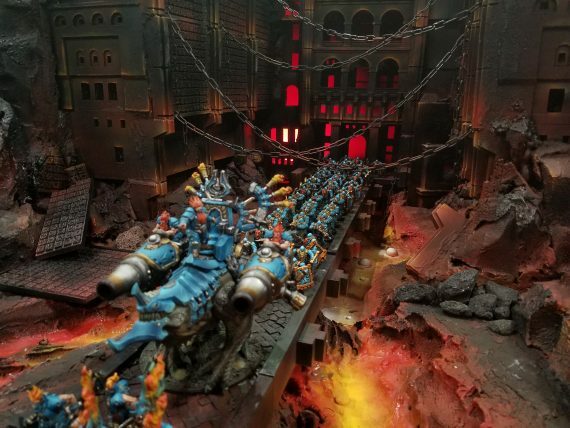 Flames of War, I believe. I'm curious about this one. I only saw it in passing, something about a "Meat Grinder", which I've heard mentioned over the past few events. 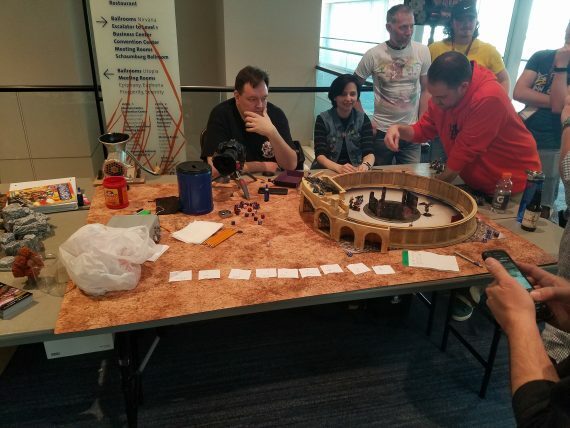 I really have no idea what it is, but it looks like gladiatorial arena combat and I'm always down with that! 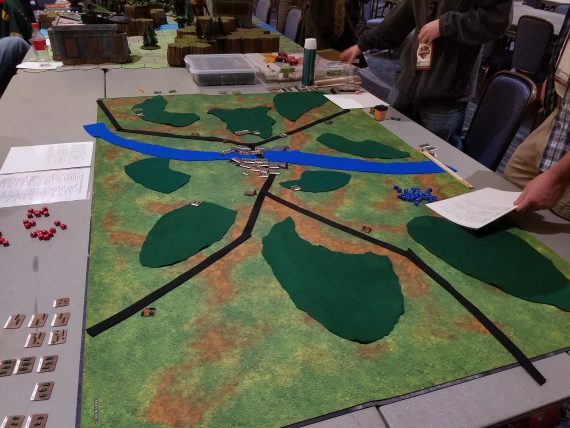 If you ever venture in to the deep dark corners of a wargaming con, you'll find the den of grognards and their arcane historical systems. Not sure what system they were using here but this looked like a blast. 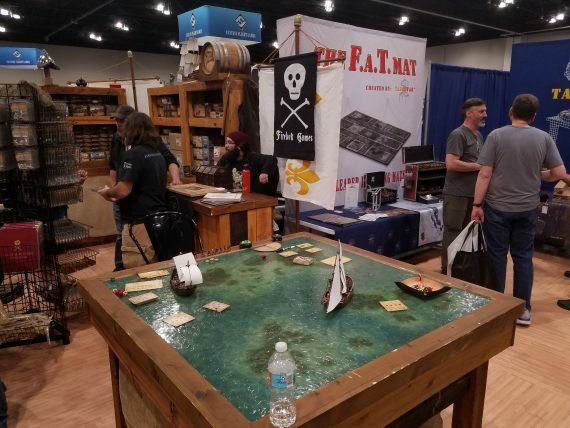 I feel like naval games may hit a growth spurt in the next year. Lots of promising titles. What people not familiar with the con don't tend to realize, is that the con is NOT just in the giant convention hall. 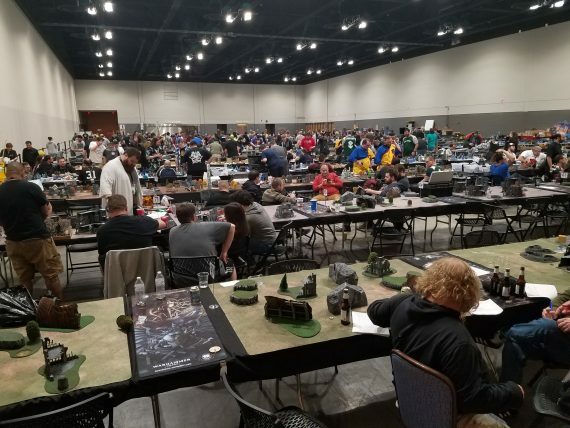 Practically EVERY conference room in the area is loaded to the brim with tables and gamers of all wargaming varieties! It's great to see. 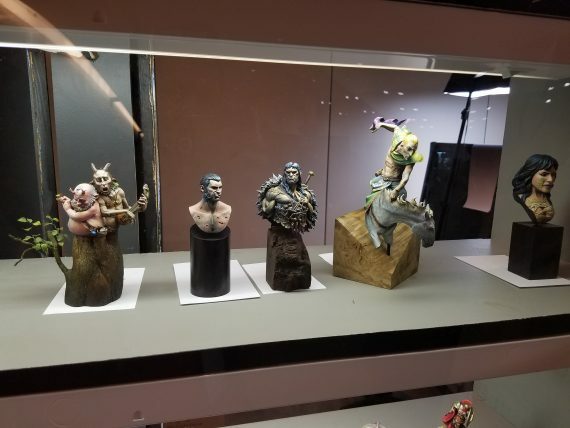 As I consider myself a figure painting afficionado, of course Adepticon is NOT complete without some views of the Crystal Brush entries! 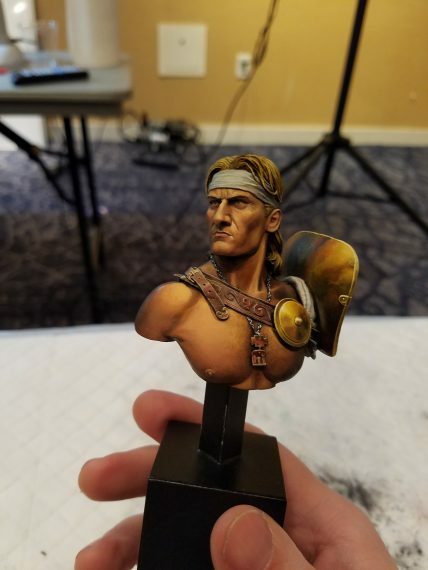 This is a very prestigious painting competition amongst hobby painters, and it brings along some of the world's TOP talents. Here were a few of the pics I could manage to sneak in through the throng of onlookers surrounding the glass cases. Ooops, pardon me, excuse me...sorry...whoops, can I just... Hah, I'm clearly not alone in my desire to get close views of these fantastic entries. 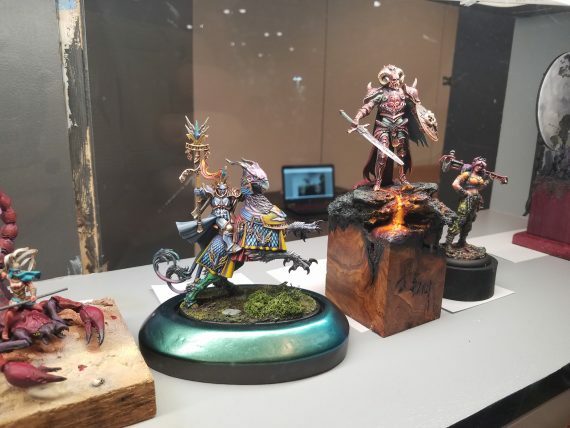 There were several cases of them, as it seems like a contest that's growing every year and bringing more and more talent to the hobby. The standards are fantastically high, and I hope one day to enter myself! Maybe in 2025, when I have free time again to spend the amount of time a project like this deserves! 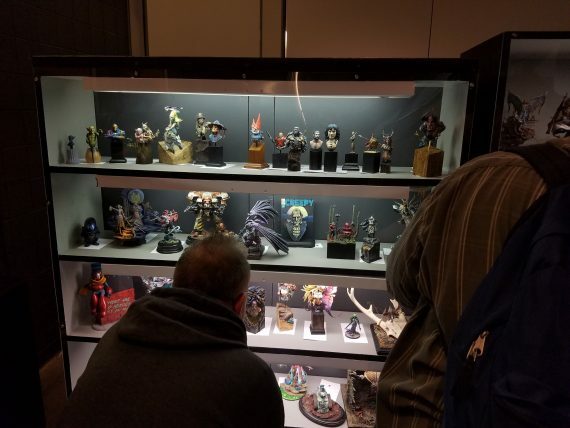 It's so cool to see some of these pieces that I've seen only pictures of, or featured in articles in person. 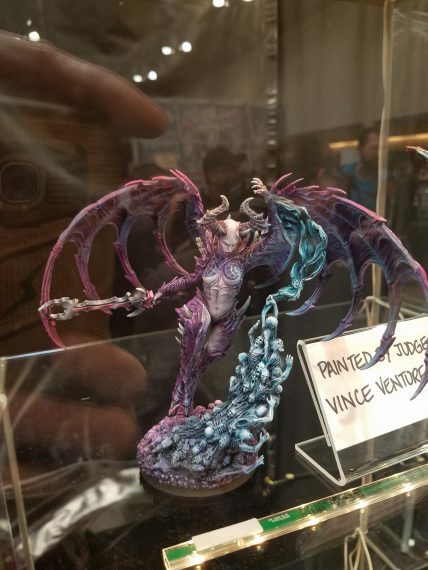 Vince Venturella did this bust and the figure below. Some awesome theme captured here, and his ever-present turquoise and purple schemes. 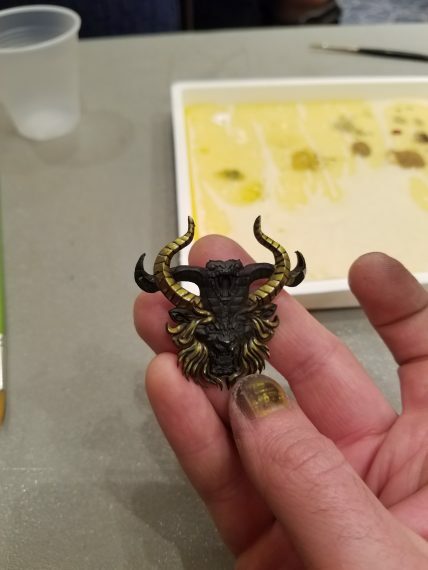 Check out his youtube channel for some great "hobby cheating" tips and generally fun to listen to/watch while you paint content! He's a great boost to the hobby. Oh man, I really love that lava plinth base. This was Scott, the Miniac's entry. It was great to watch the youtube videos about making this entry, and to see the surprising final result! With all of the mods, and scratch building, this turned out great! Check out his youtube channel as well. His videos have a stellar production quality, and are informative and entertaining! 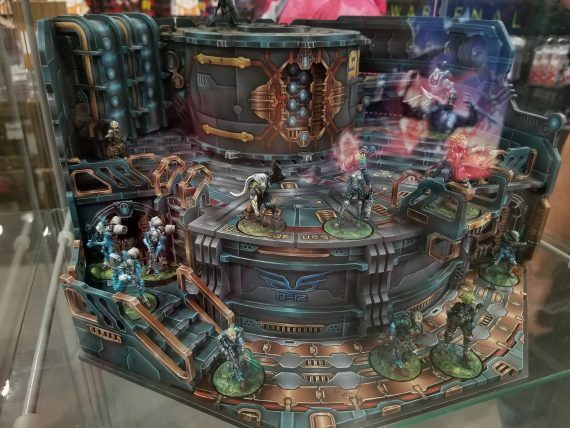 Although the colors seemed a bit muted, that diorama was super flavorful in a classy, violent, renaissance kind of way. 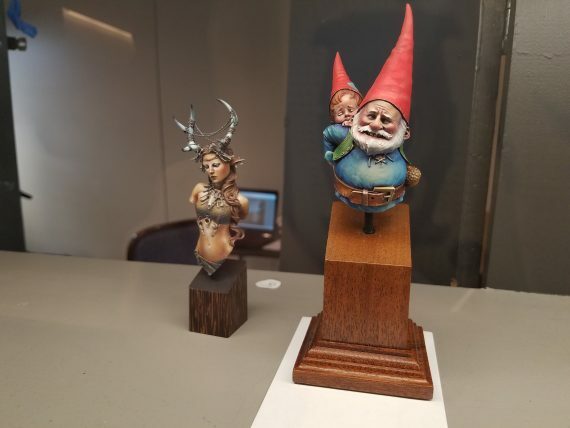 Shoshie's gnome bust. This seemed really vibrant, warm and eye-catching to me. 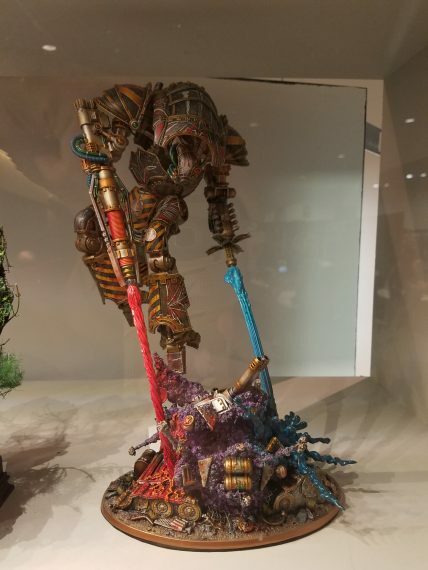 I loved both these pieces. 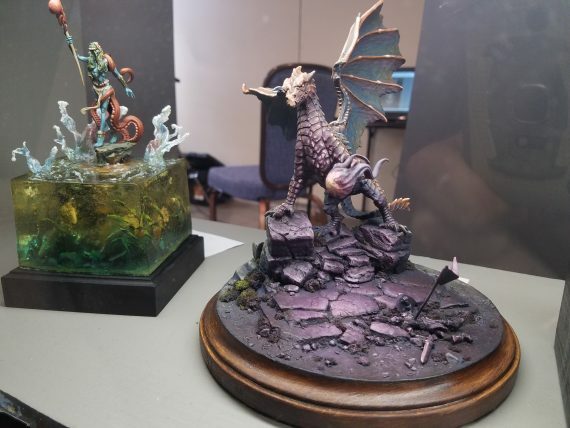 The resin water base was quite well done, and the color coherency on the dragon was great. 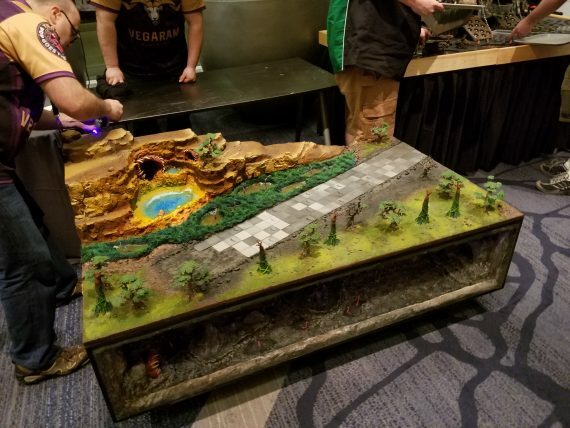 If there's one thing that impresses me about 40k fans, it's their devotion to mods and kitbashes! Some of them can really capture the drama! 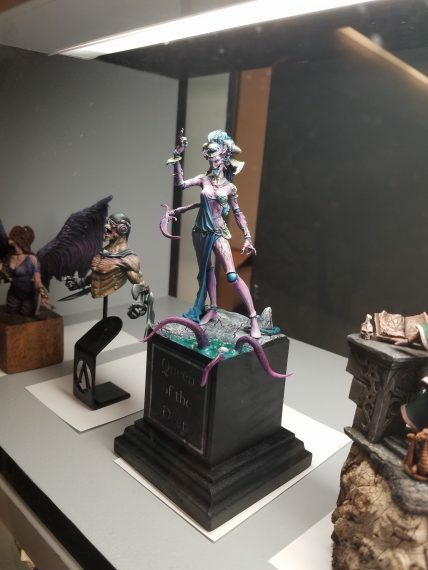 3rd Place winner overall, by the phenomenal Sergio Calvo. 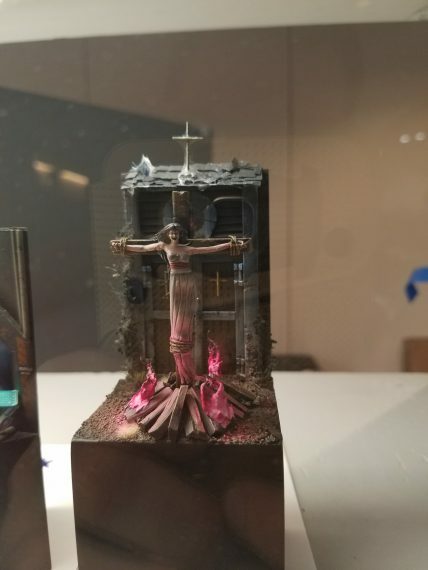 He always produces stunning work, and this piece was.....wow. Just wow. Cold. Stoic. Lonely. This won 2nd overall, and captures those feelings really well. Solid piece! First place winner overall, by the great Francesco Farabi! So glad I took his class this year as well. The dude is a solid talent, and really grasps the fundamentals of color theory...but also paints with an intuitive feel. This piece is a spectacular combination of color complements (blue - orange), (hot - cold), but also technique in terms of the NMM, and composition. Museum quality stuff here. 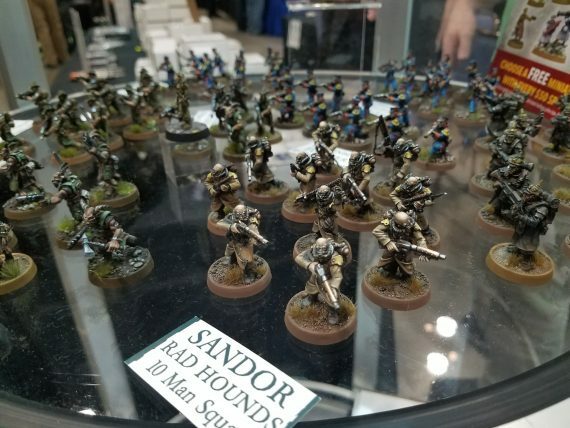 I took some painting classes this year, so I missed the Saturday evening armies on parade...err...parade. But I did catch a few as they were being broken down. Sad I missed out on that, since the few items I did catch were so elaborate! 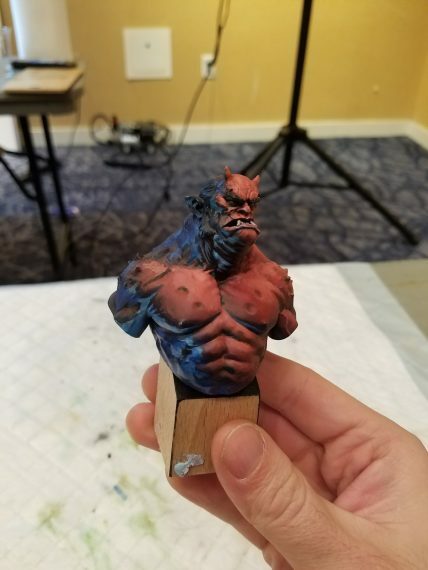 In order to take further advantage of this convention, I decided to sign up for a few painting classes with some of the world's premiere figure artists. I felt really lucky that this convention draws artists that I admire from all over the globe and follow on social media. I'm a sponge for learning more, and being creative so I wanted to gain some insight in to their processes, integrate them in to my own, and hopefully become a both a better painter and share that knowledge to build the community further. I lucked out and picked this really cool martial arts monk to start my sketch on. His story was that his mother was killed by a dwarf-caused avalanche in a mountain valley village which also blinded him. So how, he hunts those pesky dwarves in their cavernous dwellings like a dachsund hunting weasels. Lol. I got some eyebrows raised for that one. ;D I also got to try out the new, Kimera Kolors "pure pigment" paints. They're not lying when they say pure pigment! These were super saturated paint colors that felt like you could spend forever trying to thin them out but they had so much vibrant coverage. Pretty impressive...but also, somewhat difficult to use without practice. Glad I got to try these! 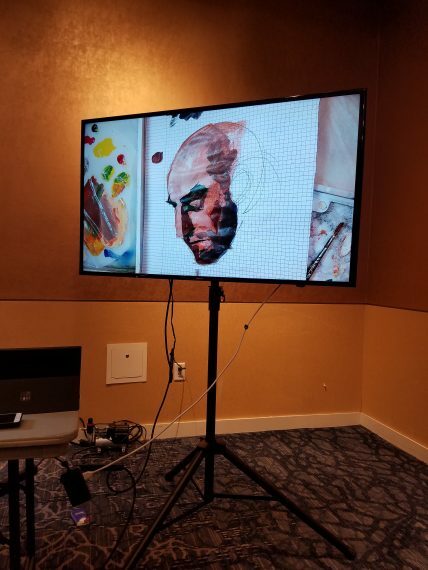 The second class I took was another color-theory, fast-painting class with Alfonso "Banshee" Giraldes. I don't say it often, but this guy was brilliant. 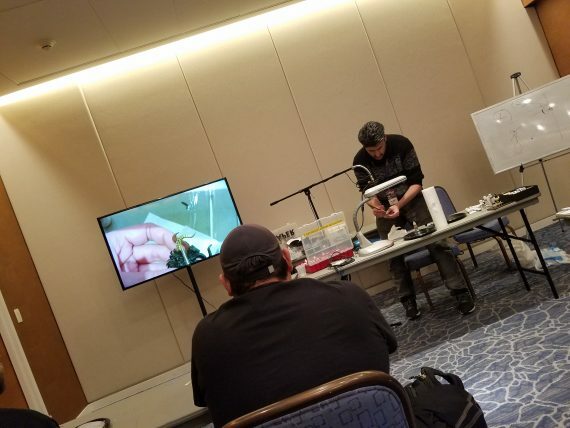 It's funny when you meet talented artists who have a solid foundation and documented technical training....and then there are guys like this, who take that solid foundation and bring a wreckless abandon to their craft. They take chaos, and make art. Super funny, quirky, but also clearly passionate about figure painting, in a way that can change your perspective and habits. Great time...that was slightly mismanaged by the convention staff (due to some judging duties, and a typo in the event descripton.) Sadly, I had to cut his class short because it was stretching in to a conflict with a prior engagement. I would have loved to see how his final piece turned out. 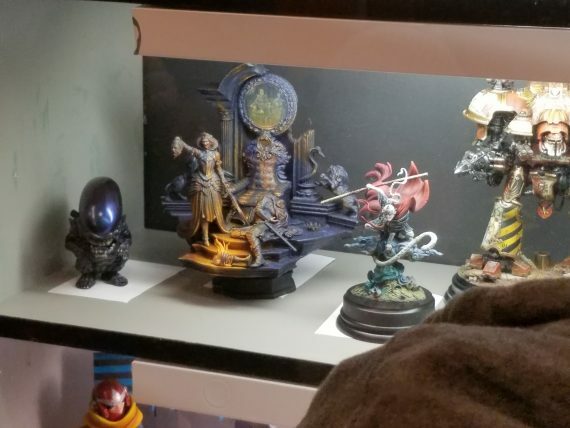 Some of Banshee's pieces that were passed around the class. I always like to take up-close reference photos to try to copy what I see, so getting to look at these fantastic pieces in hand was a real treat! Look at that dramatic lighting! Wow. It's hard to describe Banshee's painting style. 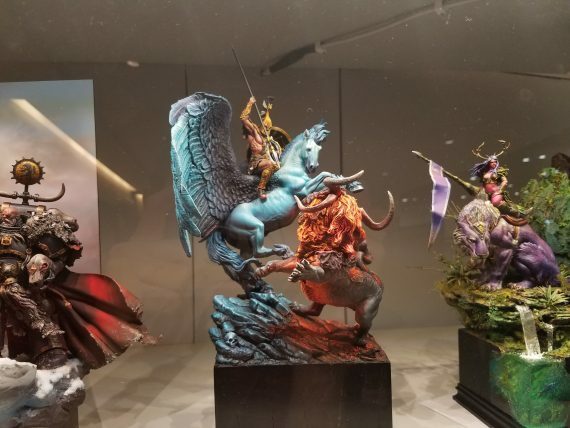 He uses metaphors, like your palette is a battlefield, with special troops you send in to balance colors....then he slaps all kinds of crazy wetness around the image/bust/figure. It's like a giant mess...until it's miraculously not! Very impressive. One of the infamous Banshee "Anonymous" busts! Finally, I have one. 🙂 I went with a non-traditional lighting angle on this one, and was probably a bit too meticulous with my highlights, but I'll enjoy further practicing on this one soon! 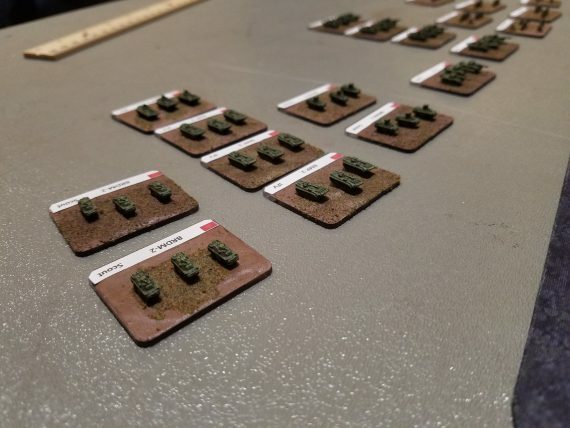 For this lesson, I also got to try out Scale75's new paint line. These were also marketed as heavy body, more saturated paints. I feel like they were easier to use than the Kimera Kolors, based solely on the typical mini paints I already use. In that sense they were slightly disappointing because they didn't offer me anything "new" compared to what I already use. Lastly, a NMM class with Riccardo Agostini . He was a very humble, methodical teacher. 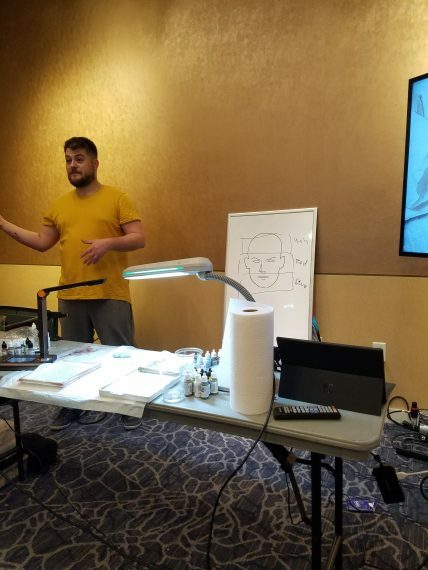 He presented a fairly straightforward methodology as to how to look at metallic lighting and implement it in a simple manner. 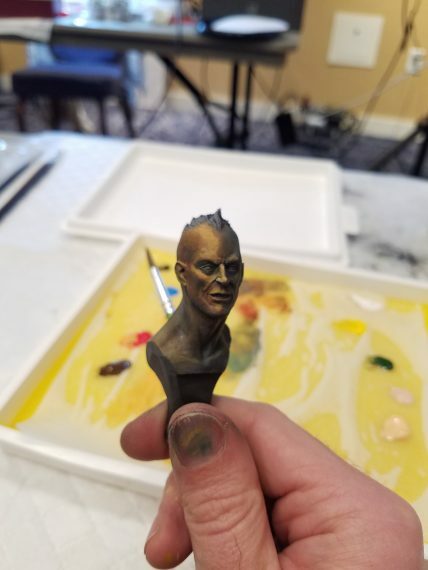 I really liked this class, as I felt like in an hour or so I wound up with the best NMM I've done so far. I also learned some tricks with paint translucency, which was cool. 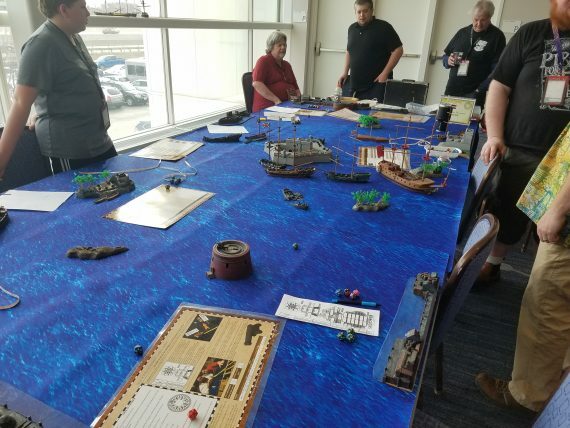 For the last part of my convention participation experience...I ran a narrative event game for the first time! Pulp Alley: The Lost Island of Amontexoatl! 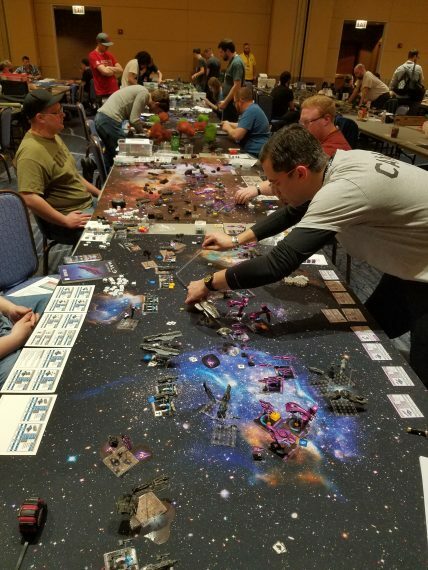 It was a lot of fun, and a great system that has just finished a successful Kickstarter for Ver 2.0 of their rules! For casual gamers, I'd highly recommend it, and will do a more thorough batrep and review very soon! 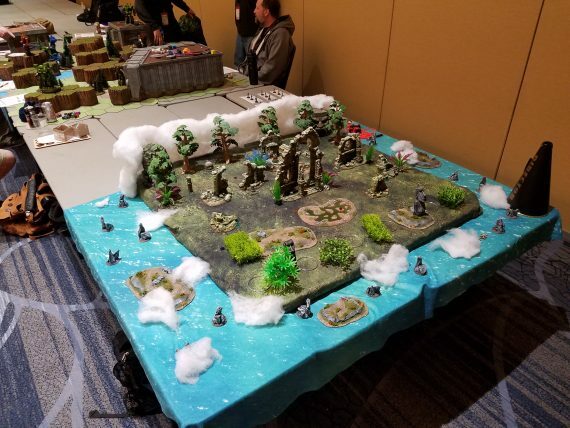 For now, I'll leave this little table pic of it during setup that caused Mel The Terrain Tutor to throw me a Whatchamacallit candy bar. lol. What mysteries await on this lost Island? Stay tuned to find out! Phew, that was a busy weekend! 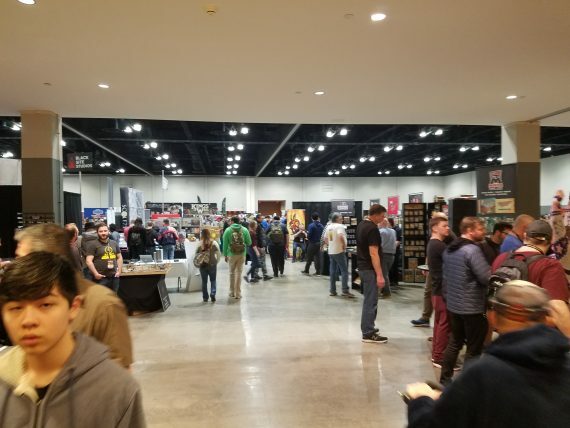 In total, I attended this year's con for 3 days. I had a tremendously great time, but I have some meandering thoughts and feelings about the way I planned it out this year as well. It was a working weekend, so I had to juggle the con schedule with my work schedule. Because of that, I felt like I was always in a mad dash to shop or look around, while also staying on time to attend my classes. Those classes were also somewhat time consuming, ranging from about 2 - 4 hours each. 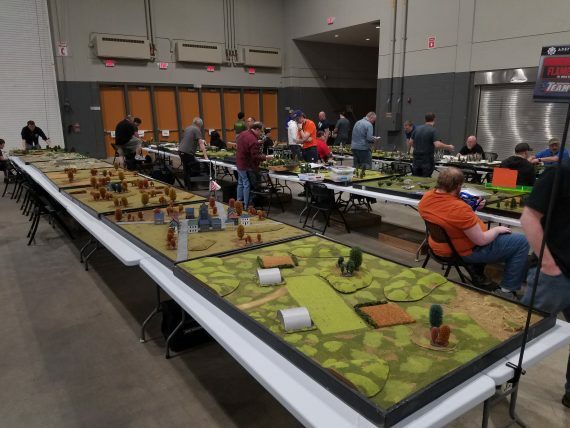 While I absolutely adore painting and gaining insight from world masters, I still found myself kind of missing just hanging out with friends and club mates. 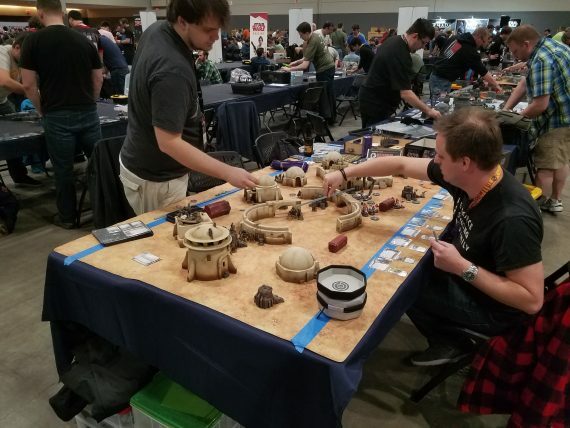 I really wish I had more time to try demos, grab a bite to eat with friendly folks, and have casual chats about our geeky passion. Plus, I totally missed out on a fun classic D&D game! Gah! I suppose the key thing I learned from this experience, is that sometimes you sacrifice something for following your obsessions. 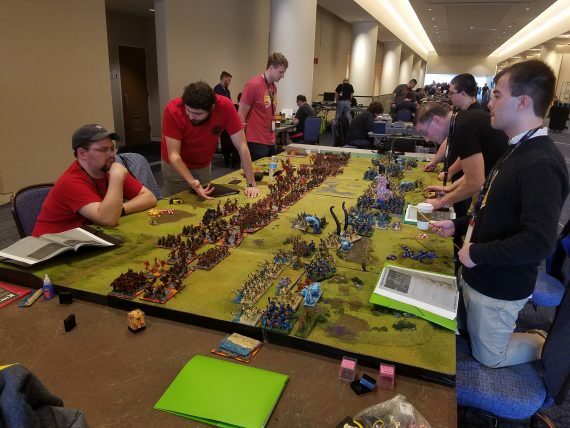 There's an inherent social aspect to this hobby, and I think to fully take advantage of a convention such as this, you need to put some focus on that.